Most of Andre Gide's richly-varied literary output has long been available to American readers. Only one aspect of his protean career has been lacking in translation: the essays, the publication of which will go far to explain why Gide holds in France such high rank as a critic. 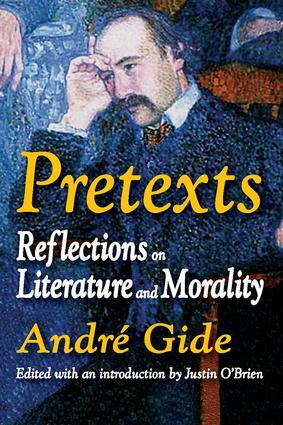 Many of the essays in Pretexts: Reflections on Literature and Morality were provoked by events in the cultural and political world of twentieth-century France, a turbulent setting that produced a lasting literature. These essays are vintage Gide, informed by his characteristic spirit�his hard brilliance, pointed honesty, and the enduring relevance of his concerns.Readers of his Journals will be prepared for the style, intelligence, and marksmanship that Gide brings to bear in these forty-two articles on life as well as on letters. His range, as always, is broad: a long and moving memoir of his encounters with Oscar Wilde; a series of combats against reactionary nationalists and self-appointed purifiers of morals; estimates of Mallarme, Baudelaire, Proust, Gautier, and Valery, among others; letters to Jacques Riviere, Jean Cocteau, and Francis Jammes; and general essays on art, literature, the theater, and politics.Justin O'Brien, famous for his studies in modern French literature, has written that Gide is "related to La Fontaine and Racine by his essential conciseness and crystalline style, to Montaigne and Goethe by his inquiring mind which reconciled unrest and serenity, to Baudelaire by his lucid, prophetic criticism." O'Brien, who has done so much to bring contemporary French literature to America, supervised the translations in Pretexts: Reflections on Literature and Morality, prepared several of them himself, and contributes an informative general introduction and additional commentary to preface the various sections of this major book.